The fully automatic sample handling-system with robots RSH are an additional option for the thermal conductivity analysers of HLC series 206, 310 and 520. 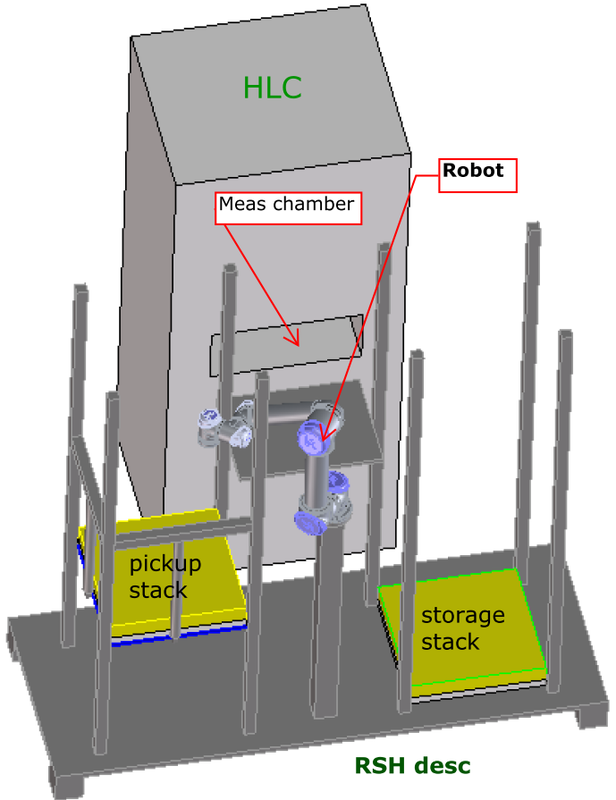 The RSH systems consists primary of an industrial robot, a pickup-stack with plates to be measured and a storage stack for already measured samples (specimen). In „Tandem mode“ with two opposite established HLC analyzers RSH feeds both instruments sample material. The effective stack height of about 1500mm allow any stacking of samples between 20 .. 200mm thickness. While the pickup stack can be loaded manually with material to be measured at any time, from storage stack measured samples could be manually removed also all time. and new sample from or into both stacks from RSH front-side. „Manual sample handling“: RSH inaktive. HLC analyser works without RSH, the operator must insert material into meas-chamber manually with using function-key door in HLC front for open or close the electrical meas-chamber door. If in „Tandem mode“ both HLC will be connected with RSH, WinHLT# on PC must be started two-times for each analyser, whereby the software than controls both change-modes (also mixed) collision-free. In WinHLT# program the operator can switch over Edit into menu Specimen data. Here he insert all specific data of specimen, which shall be measured ….. Finally with button Print BC WinHLT# generate automatically a continouse, 8-digit long number and print-out on connected printer a barcode label with readable number (Barcode printer is generally part of deliver). This printed lable has to be stick on side of specimen, finally specimen has to be lay-in pickup stack of RSH. After removing measured specimen out of HLC meas-chamber and lay-down on storage stack, RSH gets highest specimen from pickup stack, Barcode-reader identifies automatically specimen number and transfers to WinHLT# and finally RSH slides in specimen into HLC meas-chamber and starts new measurement. Both in manual as well as with automatic handling with end of measurement WinHLT# stores the last meas-data with specimen number, date, time and stored edited specimen-specific characteristics as a data-set in a csv-file on PC-harddisc. This csv-file could be evaluate inter alia with MS-EXCEL. This onetime barcode-labeling reduces errors and allowed permanent assignment of equipment, specific specimen identification data and stored measurement data. With removal and loading of specimen by robot handling-system RSH one or optimal two HLC-analysers become a fully automatic meas-system which will be used for errorfree, time-optimized, serial quality control as also for permanent tests in material-developement. Also RSH has the usual 3-year factory warranty of all HLC analysers in accordance with our conditions described in the offer.